The state’s competitive solar market is now facing disruption by a new proposal from Arizona Public Service Company (APS) to get into the rooftop solar business. In its proposed 2014 RES Implementation Plan (for PowerSuite users; other PowerSuite links are designated PS), APS is asking the Arizona Corporation Commission to approve “AZ Sun DG” – a program that would allow the utility to own residential solar and offer monthly rebates to its customers that undercut its third party competitors. Private companies like AEE members SolarCity and Sungevity have been helping Arizona customers overcome the upfront cost of solar through leasing and power purchase agreement (PPA) programs for years. 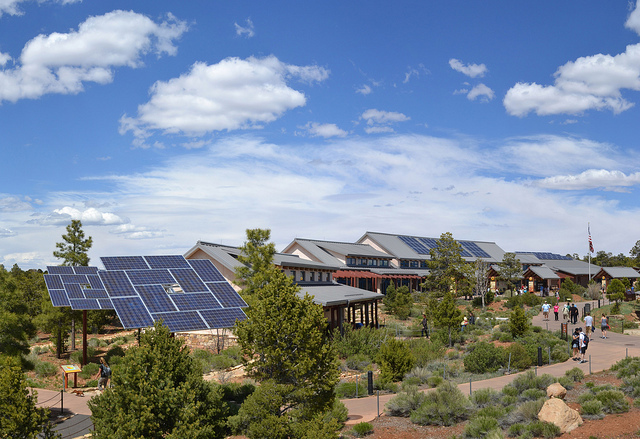 Arizona’s net metering policy provides a way for solar customers to “bank” the excess power that they produce and get full credit for that power when they need power from the grid. Last year, net-metered customers in Arizona faced a challenge when APS petitioned the Commission to impose a monthly charge of $8 per kilowatt of installed capacity to be connected to the grid. The Commission then adopted a compromise, authorizing utilities to charge a “connection fee” of $0.70 per kilowatt of installed capacity per month (PS) for net-metered customers. For the average 7-kilowatt residential solar system in Arizona, that adds up to about $5 a month. Now APS has done a 180, proposing to waive these fees and own residential rooftop solar systems outright without fretting about burden on the grid. AZ Sun DG would install 3,000 residential 4-8kW solar systems in low-income communities and at strategic points in the distribution system, feeding power into the grid rather than the households. APS would essentially be renting participant’s rooftops for a $30 a month savings on their bill. The project is estimated to cost between $57 million and $70 million in total. However, other solar firms think AZ Sun DG would kill the solar market in Arizona, not improve it. Of concern to competing solar companies is the fact that the $30 monthly savings APS is proposing is more than the $20 average monthly savings that third party companies in Arizona can offer customers. The question is whether the higher monthly savings is a function of the utility’s advantages as a regulated utility rather than its ability to deploy solar at lower cost. APS is guaranteed a 10 percent return on equity from its rate base, which it collects from its customers. While it’s still unclear whether APS would be able to spread the cost of this particular investment to its customer base, as monopolies, utilities have certain advantages that give them a leg-up in a competitive marketplace. They already have proprietary system data available which allows them to install DG strategically, in areas that extract the most value out of the installations. In addition, they have strong brand recognition and an existing relationship with their customers, which allows for significant marketing cost savings. The Commission’s decision could have a significant impact on the future of the solar market in Arizona, third party solar installers, and public utility customers, not to mention set a national precedent. APS has asked the Commission for a decision by September. If all goes according to plan, the program could be up and running in 15 months. Stay tuned. Image courtesy of Grand Canyon National Park.